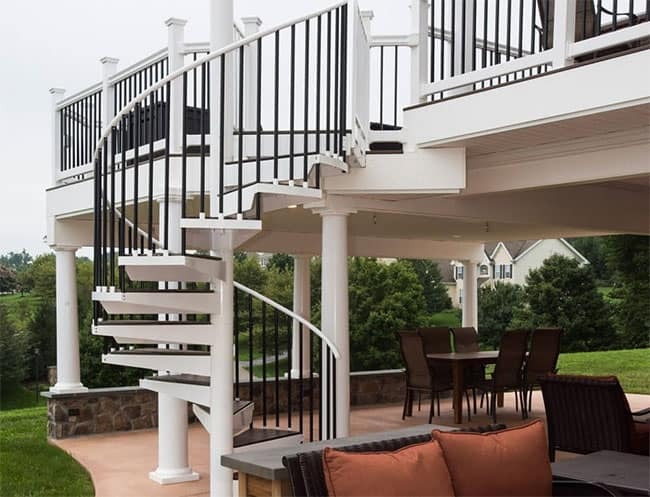 This unique outdoor living space and custom spiral staircase complement and elevate each other to bring you the 2018 Outstanding Deck Installation. Mr. Tyree came to Paragon to find the perfect piece to connect his deck and patio. The finished project is astounding. 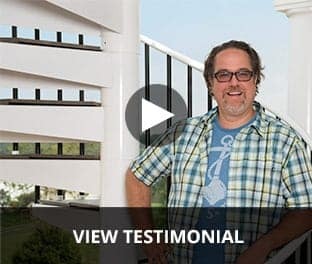 Mr. Tyree was looking for more than just a deck installation. With a love of entertaining, the Tyree’s want an outdoor addition that would cater to outdoor parties during the beautiful Pennsylvania summers. With their indoor space guest ready, an amazing deck and patio were the next step. Mr. Tyree wanted a large open space where guests could move between the different levels, both indoors and outdoors, freely. As he worked with his deck builder, it became evident that the perfect stair selection would become the focal point of the entire design. There were two outdoor staircase options for Mr. Tyree’s new deck: a spiral staircase or a traditional all-wood staircase. With a balance of style and function, a spiral staircase was the obvious choice. Not only does Paragon provide a wide range of materials and finishes, but the small footprint maximizes the square footage on both levels. 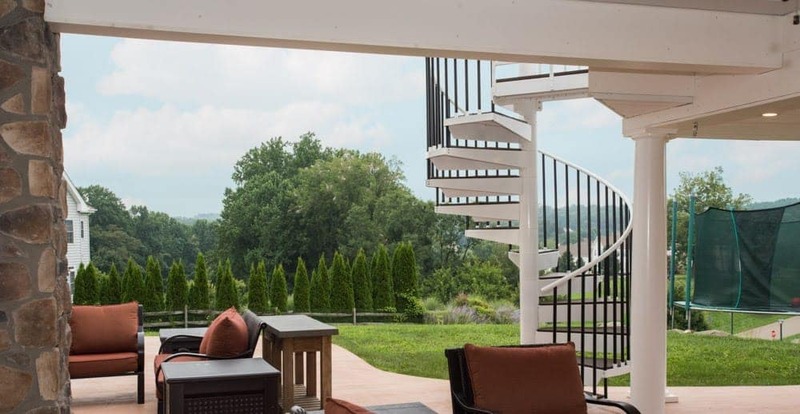 He customized a Configurable Aluminum Spiral Stair to create a centerpiece for outdoor entertainment area. Paragon’s Configurable Aluminum Spiral Stair product line was the ideal choice for Mr. Tyree’s custom deck design. 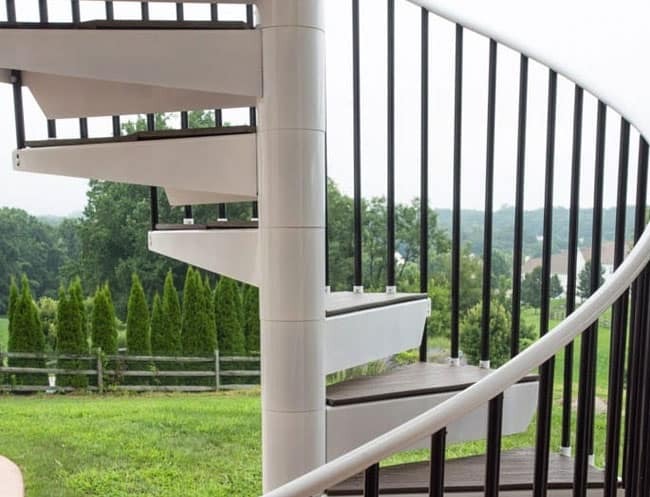 The lightweight frame was paired with a custom color powder coat finish to create a staircase that’s not only maintenance free, but matches the rest of his deck railing. 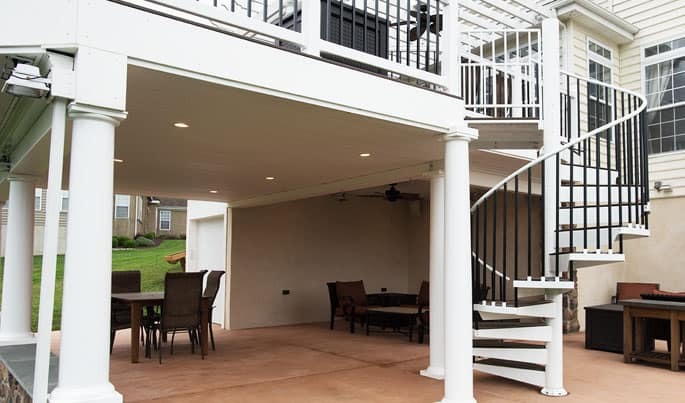 Mr. Tyree further customized his spiral staircase with tread covers to match his deck boards, creating a unified space from the upper level deck to his covered patio. 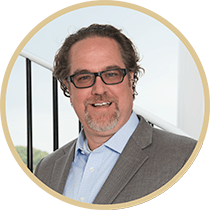 Throughout the design and buying processes, Mr. Tyree knew he made the right choice. Paragon’s consultative designers altered the design to match any changes made to the deck design, including height and rotation. After an easy installation, Mr. Tyree had a custom deck stair that fit seamlessly into his new outdoor living space. 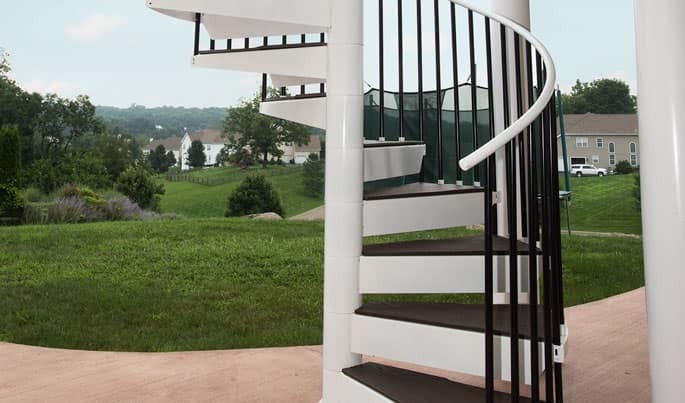 Paragon Stairs offers a wide range of weatherproof outdoor spiral staircases to fit every project, space, and budget. With both DIY kits and custom designs available, you can choose a staircase that completes your ideal outdoor space, just like Mr. Tyree. 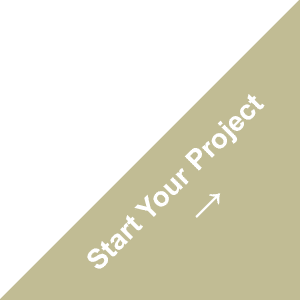 Browse over 5,000 design options and call today for your free consultation. Or call 1-888-939-3778 to get started! Spiral staircase is a joy. Worked very closely with the Salter representative to get the dimensions accurately measured and the proper direction of the spiral. Once the unit was received I was able to install all of it myself except for the top step off pad. I had someone help lift it onto the post and then hold it place while I bolted it to the deck. The rest was all details that I easily handled and installed. A little care was all that was needed to complete a great addition to our outside living. My experience with paragon was very seamless. From my initial call to the actual order to the delivery was very simple and well explained. I will have no reservation placing another order with them when the need arises. The assembly of the spiral stairs was very easy and explained well in the paperwork that came with the kit. I definitely recommend the stair kit to anyone looking for a reasonably price and simple to install. They look and work great too. I fixed the basement of my house and needed to install a spiral stair but there was a problem, the space between the walls was too narrow. I called many places including Home Depot but no one was able to provide the kind of stair I was looking for. I also called people who work in the same trade and came to see and measure the space where the the stair would be installed but they were also unable to make it because they claimed the space was to small. Finally I found this company "Paragon Stairs" and I call them. When I told them about the space they also claimed that the space was not proper for a regular spiral stair. However, there went the extra mile and asked me as many details about the space and asked me to send them pictures and videos and all measurements of the space, and so I did. I few minutes later after they had received all the measurments they called me told me that there was a solution, and that they were going to customized the spiral stair, and that it was going to fit perfect on the spaced. Then they send me the pictures of how the stair would look and fit. I agreed with their proposal and within 3 weeks they send me the stair and I install it very easily and it fits perfect on the space. The communication and support was perfect as well as the price, and quality. I give these people 5 stars. They really deserve it. I will recommend them to my friends for their stairs needs. The staircase is a very good design, clean & sleek, a piece of sculpture that went together fairly easily. Thank Paragon Stairs for excellent workmanship, good customer service, and support. The instruction manual needs work, confusing, and drilling bolt holes in the platform was very hard. Six women put this together, but we needed a very strong man to help us...steel stairs are very heavy. Overall I am very pleased....from the initial phone consultation, the order design, shipping and quality of product. The only reason I didn't go a full 5 stars is that the hardware that came with the unit was not the hardware described in the instruction. The piece that attached the balusters to the handrail was a completely different design than that referenced in the instructions. I figured it out, and the finished product is in place, functional and looks good.....great experience overall.